Artificial Intelligence, Machine Learning, Deep Learning are the buzz words across the globe today. Businesses, as well as people, are trying to make out if it is simply hype or not. While there is hope there is also gloom somewhere, as far as AI is concerned. There is a lot of work to be done to ensure effective and valid deployment of AI solutions. Today’s AI concern is Frameworks and toolsets to manage the entire lifecycle in an integrated manner to ensure dependable results - which is the burgeoning need for AI to move forward. In this discussion, we will be focussing on some of the important challenges faced with respect to resources, frameworks, tools, and techniques for implementing AI and also the direction it is trending towards. Artificial Intelligence, Machine Learning, Deep Learning are the buzz words across the globe today. Businesses as well as people are trying to make out if it is hype or not. While there is a hope there is also gloom somewhere, as far as AI is concerned. Lots of work needs to be done to ensure effective and valid deployment of AI solutions. Today’s AI concern is Frameworks and toolsets to manage the entire lifecycle in an integrated way to ensure dependable results is the beckoning need for AI going forward. In this discussion, we will be focussing on some of the important challenges faced with respect to the resources, frameworks, tools and techniques and also the direction AI is trending towards. AI is changing the way organizations do businesses and how they interact with customers. AI continues to drive the change. Deep Learning and Natural Language Processing will become standards in AI solutions. Deep Learning is based on brain simulations and uses deep neural networks. AlphaGo is the first AI system to defeat a professional human Go player, the first program to defeat a Go world champion, and arguably the strongest Go player in history. Baidu improved speech recognition from 89% to 99% using Deep Learning. Every AI and Machine learning scientist is required to know Deep Learning tools in his / her current job scenario. In this session, we will be discussing what is Deep Learning and why it is gaining popularity. We will explain AI solutions using Deep Learning with a practical example. Deep Learning has an edge over other machine learning techniques as with the increased volume of data, performance increases with Deep Learning. Further, Deep Learning enables Hierarchical Feature Learning i.e. learning feature hierarchies. 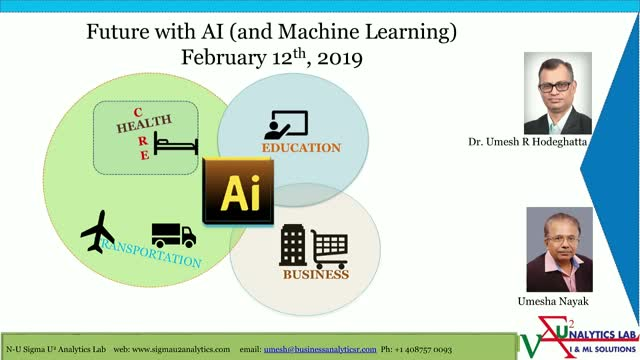 Catch this follow up Q&A from the A Guide to Machine Learning Patterns and Data Visualizations presentation. Umesh answers remaining and follow up questions from the audience.